Just when you think nothing else could go wrong. This isn't normal for a passengers side catch can, is it? It looks like coolant, with a layer of oil on top, but theres none of the foam or creamy white stuff. Dipstick and oil cap are clean also. 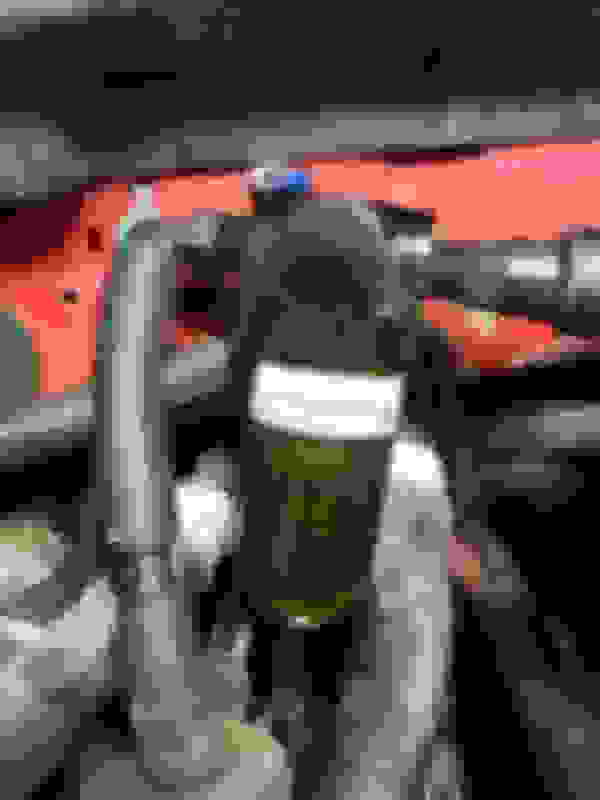 Is it possible that it's not coolant? The green is pretty telling, but its not acting like coolant. BTW: this is from 20 miles of running, thats all. Pretty crazy. I think the PCV valve is bad. 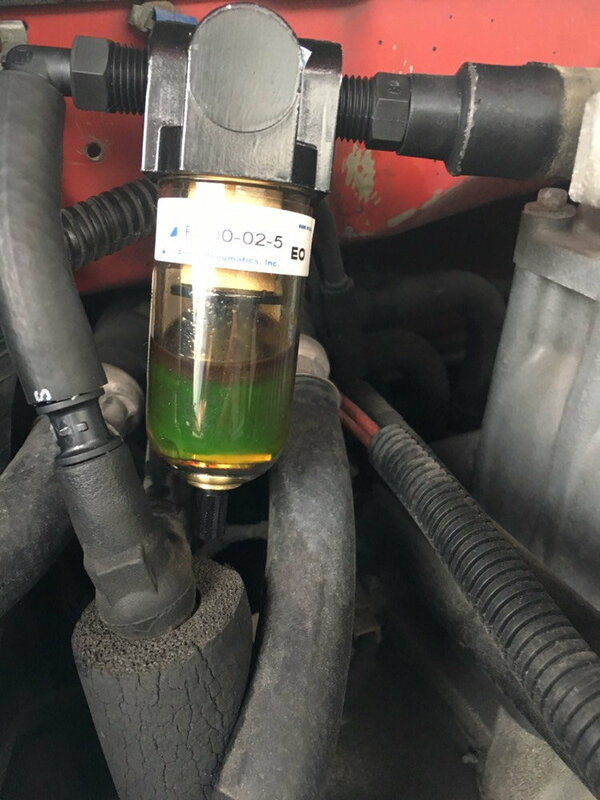 Coolant and oil? Or just separated oil? I would drain it and smell it. If it's coolant, then it will smell sweet. No sweet smell at all. It smells like pure oil. But that’s a ton of oil for so few miles. Interesting. Only other thing is algae. I have no idea. I’ll drive it tomorrow and see if it happens again. Did some searching and it looks like a head gasket swap costs as much as a reman long block, so that’s definitely not getting done. I miss pushrods. maybe the intercooler is leaking and it's not headgaskets? No clue. I brought it into the shop today and they agree that it doesn't smell like coolant, it just smells like oil. I'm thinking a leak down test may be in order, because I have no idea how else to see what, if anything, is leaking. 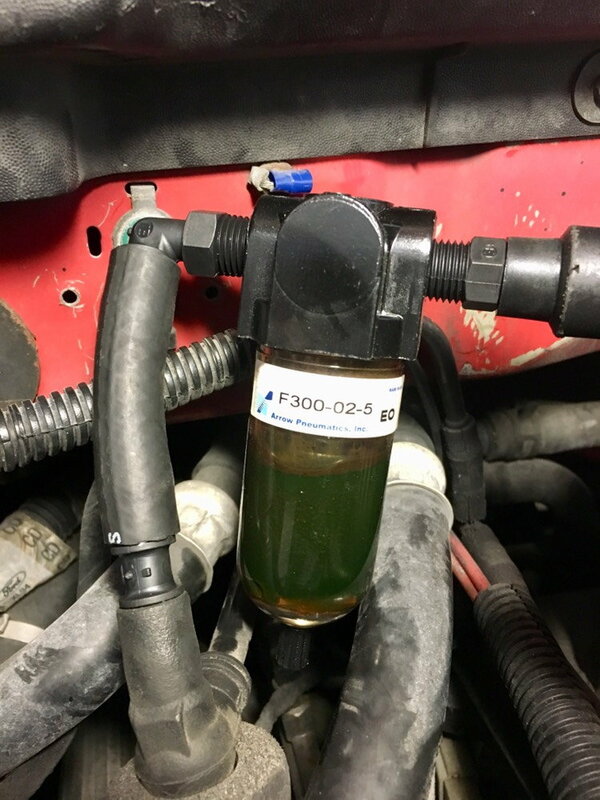 It is likely that your intercooler is leaking and the fluid is being picked up through the pcv system. Check your intercooler fluid, it could be low. I think you may be right. Just spent over an hour on Google and that seems pretty common for the older 99-00s with the 9 row core. Gotta see how I want to go about fixing it, whether it be mutt plate, old style core, new manifold/core/blower, whatever. I'm sure Ford isn't still doing the service campaign 18 years later, so I'm going to be on my own for this if it wasn't already done (which I need to get my borescope and check, cause I can't see the part number on the mid plate without it). EDIT: Oh boy. Mutt plates are no longer available through Ford, and neither are the 9 row cores (both come up as obsolete). Of course, my truck was never updated and still has that. They suggest converting the intake manifold, intercooler and blower to the new style, which costs several thousand dollars. I'm thinking a nice $700 super chiller core from LFP is a better option, if necessary. Want to have the old one pulled and pressure tested before I buy anything. I'm quickly beginning to hate Ford. Last edited by Mike_L; 09-11-2018 at 05:48 PM. She filled the can again, this time on a 5 minute trip around the block, and when she goes into boost, the exhaust lets out a puff of smoke. Not sure on the color as I'm looking at it through tinted windows, but it looks dark gray. Shop is supposed to call me when they find out what parts they can get. I changed the PCV yesterday, but apparently it did nothing. Is there some sort of dye that I can safely run through the I-C to see if thats where the coolant is coming from? O'Reillys said I can run regular radiator dye, but I wanted to check first. Last edited by Mike_L; 09-12-2018 at 02:52 PM. Reason: Added pic. Confirmed that its the core. LFP told me to just use red food dye. I did and the catch can looks like a blood filled test tube. Shop thinks they can have the core repaired since no stock cores are available, but I have my doubts. Thank god its not the head gaskets. That would have pushed me over the top and I probably would have replaced the whole powertrain with a newer 5.0 and 6R70W from a Mustang. Problem is, I can't help wondering whats going to fail next. The motor was already not wanting to rev past 4500rpm, so it could be the short block next. Or that could have been due to the clogged cats and now it'll be fine (the shop is putting on MagnaFlow midpipes while they have it). Who knows? I greatly appreciate the help i'm getting here though. Other forums haven't been so welcoming. Quick Reply: Just when you think nothing else could go wrong.